2. The clothes worn by Petula Clark and Sonja Ziemann (as saucy maid Marta) are fantastic. It's too bad Petula has to spend most of the movie with chronic bitchface, because she's really adorable and has such pretty clothes. Of course, if someone were trying to steal David Tomlinson (and half a pig!) from me, I'd be pretty angry, too. 3. Whoever did the set decoration was a genius. I want to move into Basil's parents' house right now. Made in Heaven is available on Netflix Watch Instantly. Oooo, some really cute outfits here! Wow, thanks for this post. I had never seen Petula Clark pre her blonde days. I saw Petula in concert earlier this year - for an 80 year old woman, she is amazing! Great post. 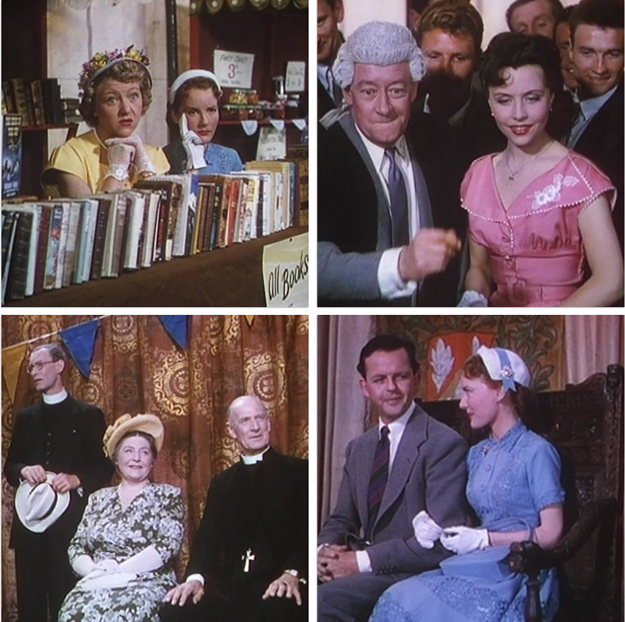 Love those photos from the film. Amazing costumes. Petula was one of my favorite singers. 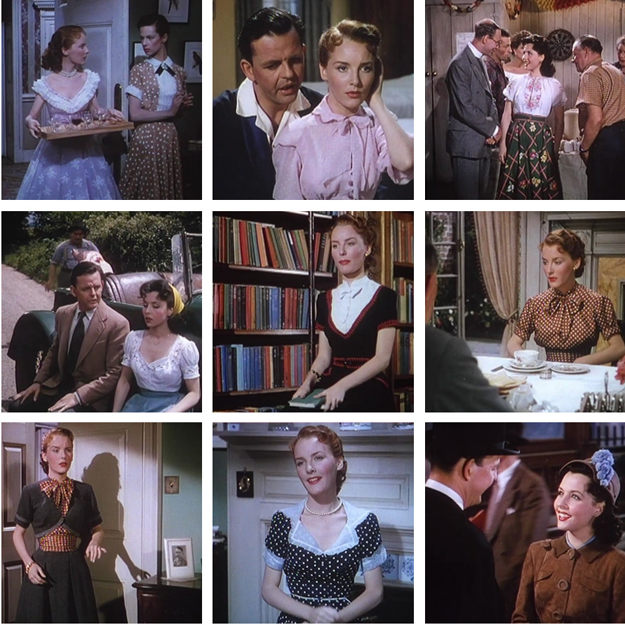 I love the clothes and sets from old movies...especially when they're so well done. Off to read parts 1 and 2. I'm so glad I'm not the only one who loves Petula Clark. Now I just need to watch this movie. Apologies if someone has already sent this link but it STILL GOES ON in Dunmow! I talked about the current festival a bit in part 1, but I hadn't read the Lovefood link. I'll head over and check it out. Hehehe...Chronic bitchface...I hate when that happens! I've never heard of this movie although it sounds cute. Those pesky Hungarian maids...did she steal the bacon? Is this on netflix per chance? The clothes are SO! BEAUTIFUL! I'm only familiar with the scooter-dress, side swept bangs, false eyelashes Petula Clark of the late sixties'...she looks a lot like Deborah Kerr (except angry, like you said) in most of the stills you posted. I never knew who David Tomlinson was either, though I think I've seen him all over the place in British movies. 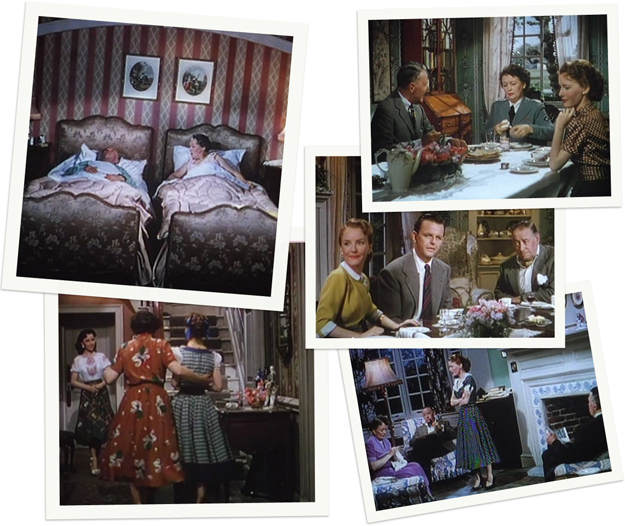 I love that hyper-colorized color they seemed to use over there in the forties' and fifties', as in Blithe Spirit. Everything looks like a catalog ad! I love old technicolor--it's too bad this film has degraded quite a bit. I'm sure it was glorious when it was released. I like the "hyper reality" of technicolor and kodachrome. Hi Lauren. Great blog. I covered the 2012 Flitch Trials for love food.com http://www.lovefood.com/journal/features/16356/flitch-trials-marital-bliss. I didn't realise it had been featured in a film (I've been too busy ploughing through the William Harrison Ainsworth book on the subject! )!